It was pretty chock a block with Springy Holiday Goodness at the thrift store. 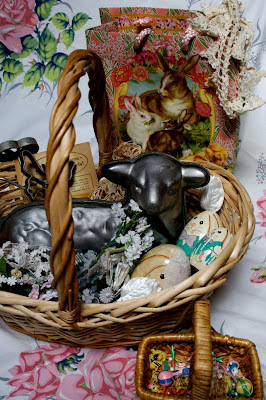 I got vintage-y blossoms, great crown lace, a chipped up, egg shaped bunny matroshka doll (destined for a refinish, random, tiny, wooden Easter-y charms), baskets, a bag, a set of rosette irons, a pie crimper, a vintage table cloth and a lamb cake mold. Since the face got a bit crumbly, I guess I'll have to frost it. But it is cute, like a little cake-y sculpture. I'll frost it and give it to a friend. Because it's about process, not just product. oh, I love it...it looks just like my little newborn lambs I used to have when I was younger.....hardly any fur and covered in amniotic fluid. I know it seems weird but I love spring! p.s. My word verification is "coatt" --how fitting is that? Meanwhile, how's the Christmas craft thing working for you? I had to laugh out loud at "Naked Lamb Cake" I don't know why, but it has kept me in giggles for the last at least 45 minutes. Thanks for the good laugh! And happy you had such a great thrifting day! oh that is just too cool! I love that cake! just eat the head first!